The KC-135 Stratotanker was originally used to support bombers of the Strategic Air Command. The midair refueling capabilities allowed fighter missions to spend hours on the front lines, rather than a few minutes, which was usually due to the limited size of fuel tanks in the fighters. The U.S. Air Force celebrated the 60th birthday of the KC-135 Stratotanker Aug. 31, 2016. The first Stratotanker flew in August of 1956 and was later delivered to the Air Force in June 1957. The first KC-135 was delivered to the 93rd Air Refueling Squadron, which was assigned at Castle Air Force Base, Calif., at the time, but has since been relocated to Fairchild AFB, Wash. The aircraft was originally used to support bombers of the Strategic Air Command. The midair refueling capabilities allowed fighter missions to spend hours on the front lines, rather than a few minutes, which was usually due to the limited size of fuel tanks in the fighters. “In short order, KC-135s became the backbone of SAC, enabling our bomber force to maintain the peace because of its deterrence capability,” said Jim O’Connell, a 92nd Air Refueling Wing historian. 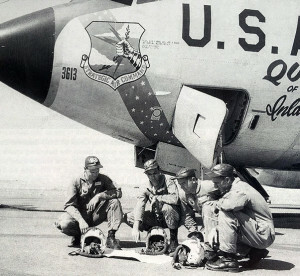 SAC had the KC-135 in service from 1957 to 1992. 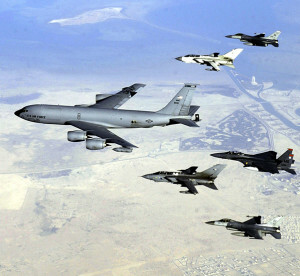 Following the inactivation the command in 1992, most KC-135s were reassigned to the newly created Air Mobility Command. A few of the records broken include: most distance covered in a closed-circuit without refueling, highest speed for 2,000 km (1,242 miles) and highest speed for 5,000 km (3,106 miles). In 2001 the first KC-135 with the new Multi-Point Refueling System, which included refueling pods on each wingtip, along with the boom, allowed refueling of any type of aircraft on any mission. The first KC-135 Stratotanker assigned to Fairchild Air Force Base, Wash., in 1958 was named “The Queen of the Inland Empire.” This year the Air Force celebrates the 60th birthday of the KC-135. Fourteen years later, another upgrade to the aircraft was made, and Fairchild AFB received its first aircraft modified with the Block 45 communications, navigation and surveillance and air traffic management upgrade. Since 1958, the tankers of the 92nd and 141st ARWs have supported everything from aeromedical evacuations, command and control, airlift missions, treaty enforcement and overseas contingency fighter and bomber missions.